The Bell XP-77 development was initiated by the United States Army Air Corps during World War II to produce a simplified 'lightweight' fighter aircraft using so-called "non-strategic" materials. Despite being innovative, the diminutive prototype proved tricky to handle and the project was canceled when the XP-77 did not deliver its projected performance. While originally conceived using an air-cooled 500 hp Ranger XV-770-9 12-cylinder engine with a supercharger, the prototypes were delivered with the unsupercharged XV-770-7 engine due to engine development delays. The planned armament was one Hispano 20 mm cannon and two 0.5 inch Browning machine guns, with the option of either a 300 lb bomb or 325 lb depth charge. 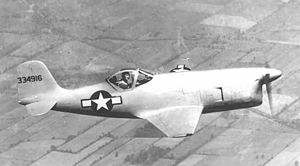 The XP-77 proved to be difficult to fly and despite flying without guns or armor, it did not come up to the expected performance estimates mainly because it was woefully underpowered. Further trials were conducted at the A.A.F. Proving Ground at Eglin Field with the second aircraft, which was destroyed when it entered an inverted spin while attempting an Immelmann, and the pilot bailed out. The development was terminated in December 1944. Picture - Bell XP-77 side view. 2x� .50 in (12.7 mm) M2 machine guns with 200 rounds each. Green, William and Gordon Swanborough. WW2 Aircraft Fact Files: US Army Air Force Fighters, Part 1. London: Macdonald and Jane's Publishers Ltd., 1977, pp. 25-26. ISBN 0-356-08218-0. O'Leary, Michael. USAAF Fighters of World War Two. Harrisburg, PA: Harrisburg Historical Times, 1986. ISBN 0-7137183-9-0.